Periyar Wildlife Sanctuary (also known as Thekkady Wildlife Sanctuary) is located in the Cardamom hills region of the Western Ghats on an area of 777 square kilometers at Thekkady. It is one of the largest and most frequented wildlife reserves in India. 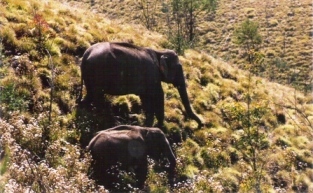 It was declared as a Tiger Reserve in 1978 and later as National Park in 1982. The Periyar Wildlife Park has been built around the Periyar Lake as a result of the construction of a dam on the River Periyar in Kerala. This artificial lake is surrounded by swampy marshes and grasslands that provide a natural habitat for a number of wild animals. This lake serves as the waterhole for the animals and they come here to drink or take a dip. The animals found are Indian Elephant, Tigers, Leopards, Liontail Macaques, barking deer, monitor lizards, Gaur, Wild dogs, Nilgiri Langurs, Nilgiri Tahr, reptiles such as the King Cobra and the python. During a wildlife tour, apart from the above animals, birds like Giant Hornbill, Darter, Cormorant, Racket-tailed Drongo, white-bellied tree pie, flycatchers and laughing thrushes can also be spotted. The splendid artificial lake formed by the Mullaperiyar Dam across the Periyar adds to the charm of the park. This is the only sanctuary in India where you can have the unique experience of viewing wildlife at close quarters from the safety of a boat on the lake. Later, you can also visit the spice gardens and tea, coffee and cocoa plantations nearby in Munnar. By Air – The nearest Airports are Madurai (140 kms), Kochi (185 kms) andThiruvananthapuram (253 kms).